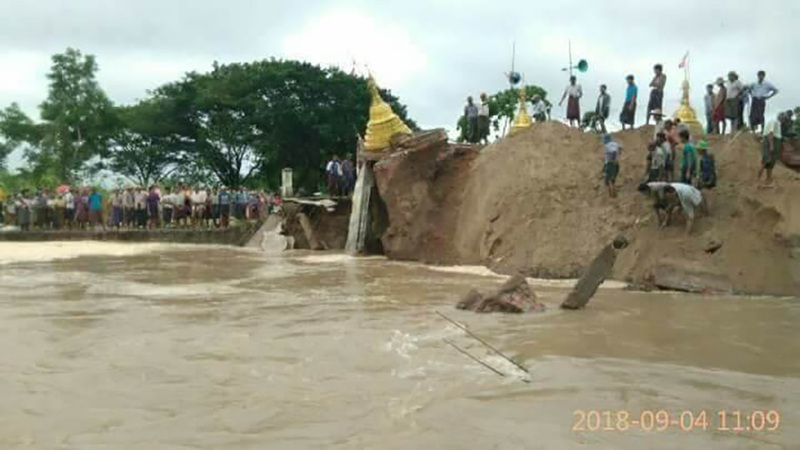 PATHEIN, Irrawaddy Region — River bank erosion in Irrawaddy Region is four times worse this year than the previous year, according to the region’s natural disaster management center. There were 57 cases of bank erosion recorded in the 2016-17 fiscal year—a number that increased to 266 in 2017-18, said a representative of the center. “The region has experienced many cases of river bank erosion lately,” said the center’s director U Than Soe. Of the six districts in Irrawaddy Region, Hinthada District recorded the highest number of bank erosion with 191 cases. It was followed by Maubin District with 57 cases, and by Pathein, Myaungmya, and Labutta with fewer cases while Pyapon District experienced no erosion cases at all. Bank erosion has been frequent in Irrawaddy Region since 2015, causing many locals to lose their homes and farmland. Schools and monasteries have also been affected by land erosion along riverbanks. “There have been more cases of river bank erosion. Rural villages are hit especially hard by it,” said Daw Ni Ni Moe, a lawmaker representing Nyaungdon Township of Irrawaddy Region in the regional parliament. Riverbank erosion accounted for 49 percent of natural disasters that occurred in Irrawaddy Region during the 2018-18 fiscal year. Strong winds were the second most common, causing 26 percent of natural disasters in the region. “Households have had to move one after another since 2015 because of erosion. It became worse in June  and all the remaining households had to move. All 200 households of our village have been relocated now,” said community elder U Myo Thant of Shwe Phala Kyun Village in Pantanaw Township, Irrawaddy Region. In the 2017-18 fiscal year, more than 92,705 people from some 23,000 households were affected by natural disasters including lightning and flooding in Irrawaddy Region. The government provided over 720 million kyats ($464,000) for disaster victim support during the 2017-18 fiscal year, according to the regional natural disaster management center.